This deliciously refreshing sorbet looks and tastes amazingly vibrant. Great as a dessert, treat or snack. Mix the sugar and 100ml cold water together in a small pan. Bring to the boil then simmer for 5 minutes until the sugar has dissolved. Remove from the heat and leave to cool completely. Peel the kiwis and roughly chop the flesh. Place in a food processor with the lime juice and cooled sugar syrup and whizz to a slushy pulp. Pour the mixture into a freezer-proof container and free for 1-2 hours, until softly frozen. Scoop into a food processor, pulse gently to a thick slush, return to the container and freeze again. Repeat this process twice more, then freeze for 4 hours or until firm. 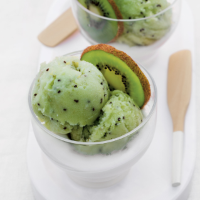 To serve, spoon some coconut yogurt into glasses, top with scoops of sorbet and decorate with kiwi slices.